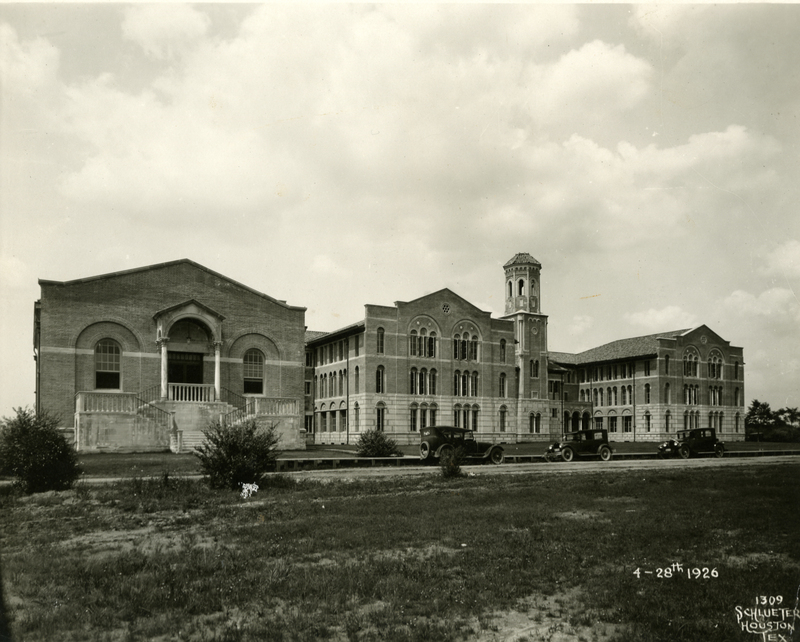 Over the last several days I’ve been working on putting together a short presentation for FE&P next week, sort of looking at the general physical history of the campus. This afternoon I was trying to find construction photos of the Chemistry Building, but they are few and far between. What I did find were several surprising interior shots that I’ll probably post sometime next week and a half dozen pictures taken over many decades of the building with cars parked in front of it. I know that this picture here was taken in 1926, but I have two others that are labeled “n.d.”–no date. Given the success of my readers at dating that last aerial photo, I’ll throw these out for comment. I don’t know much about cars, but that seems to be the only way to date these. Perhaps I should start offering prizes for correct answers. My WAG for this one: late 1940s. I don’t know, maybe 1970? The second photo would have been taken from Fondren, given the height at which the photographer would have to be to take this shot. 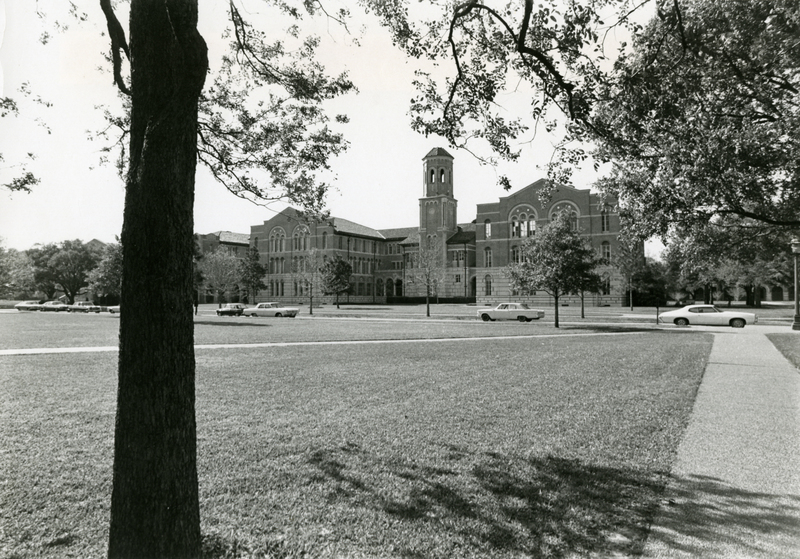 Fondren was completed in 1949, so that would be the earliest year for the photo. 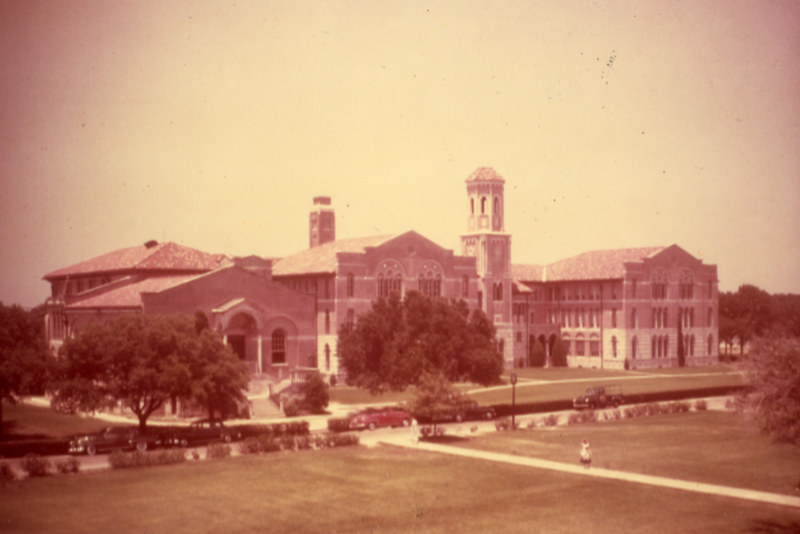 In the Chemistry Building picture, it’s hard to tell but I think the first car is a ’48 Chevrolet and the pickup is a 42-47 Ford. The pickup might also be a 48-52 Chevy/GMC with a painted grille but I’m leaning toward the Ford, looks like it has a flatter front. I may look more, I was pretty tired last night waiting for my daughter to return from the rodeo. Her first rodeo, as the saying goes. I think you can make a plausible case that the later photo might be earlier than 1970. There’s a VW Type 3 Notchback and what looks like a ’68 GM product (still trying to ID, it looks like a Pontiac but I haven’t quite got it.) as well as a mid-60s Plymouth and 62-ish Ford Fairlane.